If you’re considering the purchase of a life insurance policy to protect your loved ones, one of the most important questions you’ll ask yourself is "How much life insurance to buy?" Choosing the right amount of life insurance is a major factor in providing your family with the financial security they will need in case you pass away. And, it has the added benefit of making sure you aren’t paying for more life insurance than you actually need, given your goals and personal situation. Goals of Life Insurance– To provide the financial security your family needs in case you are no longer there to provide for them. The proceeds from your life insurance policy can be used to any purpose, including to replace your income, pay off a home mortgage loan, pay off credit card debt, pay for living expenses, provide you’re your child’s college education and provide for your spouse’s retirement, among other things. Estimate– Many people just use an educated guess to determine the amount of life insurance coverage they need. 7-10 Income– Many financial advisors suggest you use a multiple of your annual income. For example, seven to ten times your annual earnings. Needs Calculator– A life insurance needs calculator can help you get the most accurate estimate of your insurance needs based on your specific financial situation and future goals. Annual Income– How much money do you (and your spouse/partner) earn each year? Annual Savings– How much money do you place in savings each year? Total Liabilities– How much money do you owe including all debts? Total Assets– What is the value of all assets you own including home, stocks and savings? Financial Goals– What are your future goals and needs, including buying a home, saving for retirement, and college for your children. Just answer the questions asked below, then click on the button to get an instant, accurate estimate of how much life insurance you really need. 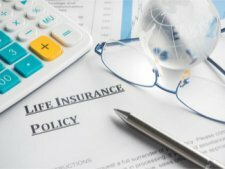 This calculator will help you to decide how much life insurance you need if your survivors invest the life insurance benefits they receive. If you have loved ones who count on you to care for them, you should carry life insurance. But, how much protection do you need? Based on your answers to the questions asked using a life insurance needs calculator, we'll provide you with an estimate of how much coverage would be best for your situation. The amount of life insurance you need may depend on how much your family will need to cover future living expenses in the event of your death. You should consider your family's comprehensive future expenses and income, including major life events; such as, college education and healthcare needs. Based on these determinations, and the length and type of the life insurance policy of your choosing, a life insurance calculator will accurately determine your needs to help you plan for your family’s future. Your current assets are also important to consider, along with any potential for those assets to increase in value over time. Life insurance can help protect your family with financial security by replacing your income. That's why it's important to customize your policy based on your needs, your expenses and your total assets. In just one simple step, this tool can help you get an estimate of how much life insurance you might need. Click here to use a life insurance calculator.